This Bicycle deck has a unique weathered look that hearkens back to the turn of the 20th century. 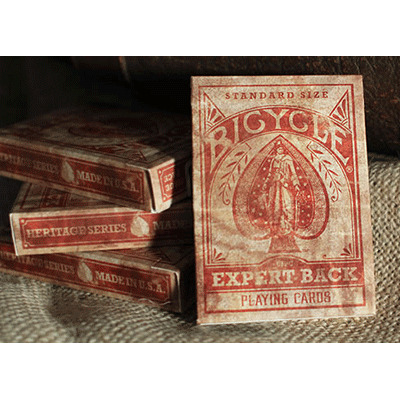 The design of the Expert Back was first printed on Bicycle playing cards in 1895. The Expert Back deck features a classic design that dates back to 1895, being one of the original designs that appeared on playing cards produced by Bicycle before the 1900s. Everything has been given a "distressed" look, to make it appear as if these cards have actually survived more than a century of years, and come to us straight from 1895, weathered by time. This is immediately evident from the tuck box, and the card backs. These cards don't just look worn, but also have the appearance of having been damaged by water, dirt, and time, and it's a very convincing look. Several decks have been produced over the years with a faux aged look, but what's nice about this one is how all the face cards have been weathered differently, making each feel unique. While the card backs are all identical - otherwise it would be a marked deck, and very impractical - each card has different stains and patterns.